Prep Time: 10 Minutes. Cook Time: 20 Minutes. Serving a side of salmon is one of the easiest ways to feed a crowd. For twelve to fourteen people, two sides are necessary, but this recipe is easily halved if you want to make it for a smaller party. It is just as delicious as leftovers the next day for lunch — I like it chilled with a salad. Preheat oven to 450°F. Line a baking sheet with parchment paper. In a medium bowl, combine the herbs, sugar, mustard, salt, and pepper. Place salmon on the baking sheet, skin side down. Spread the herb mixture evenly on each piece of salmon. Top salmon with lemon slices. Bake about 15 to 20 minutes, until the salmon is just opaque in the center. 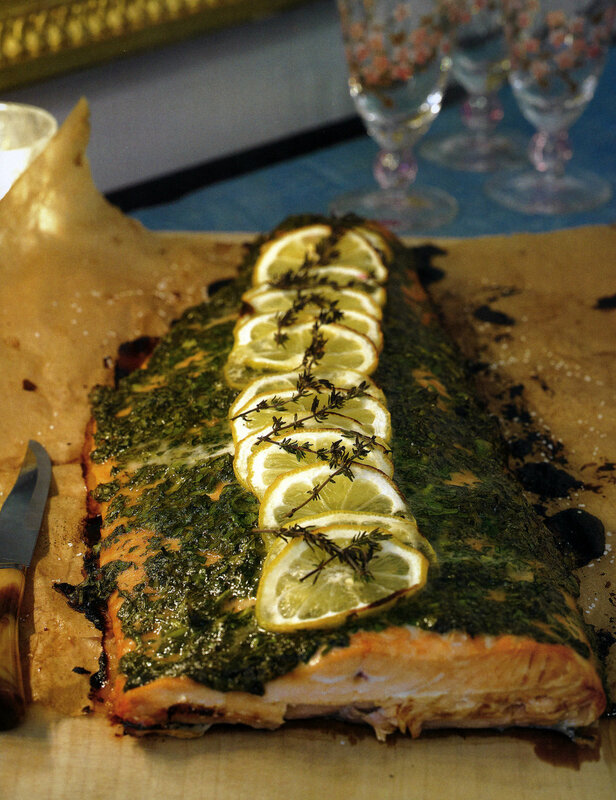 Use the parchment paper to help transfer the sides of salmon to a serving platter. This recipe is also featured in my cookbook!